GUTHRIE, Okla. – Keith Isley is one of the most decorated clowns in rodeo. 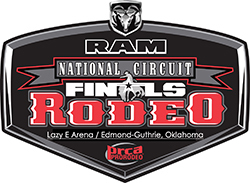 Now Isley will bring his brand of funny to the Ram National Circuit Finals Rodeo, scheduled for 11 a.m. and 7:30 p.m. Thursday, April 10; 7:30 p.m. Friday, April 11; and 1 and 7:30 p.m. Saturday, April 12. “I thoroughly enjoy watching people have a good time and enjoy what I do or what I say,” said Isley, 55, now in his 21st year in ProRodeo. “Just seeing people enjoy it and have a good time. Sometimes later in the year, you’ll get home and have some letters for you and have some pictures of you that kids have drawn. He has accomplished much. He’s been named the Professional Rodeo Cowboys Association Clown of the Year six times, the Coors Man in the Can five times, the PRCA Comedy Act of the Year six times and PRCA Specialty Act of the Year three times. For three straight years, from 2009-11, he won the funnyman’s trifecta: Clown of the Year, Coors Man in the Can and Comedy Act of the Year. In addition to being one of the best funny men in the business, he also has some of the top acts in rodeo. He’ll bring it all with him when he arrives at the Lazy E.
Isley sees a lot of smiles and has for much of his professional life. Though he was considered a class clown, being a comedian didn’t come easily. He has since overcome his stage fright to become one of the most sought-after entertainers in the game. There’s good reason for it, too. Part of a good clown’s job is to fill any down time that could some during the event. If there’s a pause in the action, Isley knows it’s his turn to step up to the plate. It works, but Isley has a lot of tricks up his sleeve. He loves working with animals and allowing them to steal the show. When it’s all put together, it’s an award-winning showcase that reaches so many people. When Isley left town, he reflected on that image and still considers it one of his greatest honors. Later that year, he earned was named the Specialty Act of the Year for the first time. The fans are pretty blessed, too.